While both Korea and Japan agree that their bilateral relationship is important for the long-term security of each country, the relationship has reached its lowest point in recent memory with no serious effort to seek improvement. The return of Abe Shinzo as Japan’s Prime Minister further soured relations as it was accompanied by discussion of amending Japan’s constitution and/or of re-interpreting clauses pertain ing to its collective self-defense to allow Japan’s Self Defense Forces to widen its scope of activities. These discussions created much hand-wringing in South Korea as a normalizing Japan revives the specter of its imperial past. Of course, it is no secret that the South Korean public holds negative views of Japan, and the public opinion data included in this report confìrms this. Thus far, this has been incorrectly assumed to mean that the public would oppose efforts by President Park Geun-Hye to pursue improved relations. But according to recent survey data, there is clear support for President Park to take steps to repair the relationship with Japan. 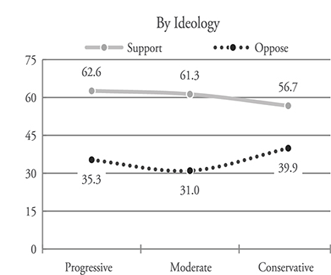 This support is both bi-partisan and includes all age cohorts. While Japan has already signaled its willingness to establish a working-level relation ship, both by proposing a Park-Abe summit and by other movement behind the scenes, President Park’s hesitancy is understandable. However, with her approval ratings near 70 percent and evidence illustrating that the public is in favor of improving the relationship, it may be time for her administration to rethink its position on Japan. the current negativity towards Japan did not always prevail. While resentment of Japan’s imperial past permeates the attitudes of South Koreans on Japan, there is also a substantial exchange of cultural goods and a deep economic relationship. 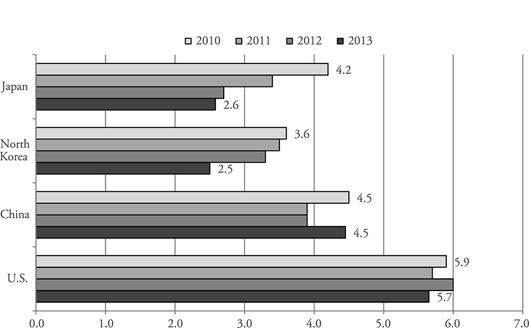 As recent- ly as 2010, Japan was viewed almost as favorably as China (Figure 1). The view was still not positive overall, but it was certainly much less negative than in 2013.1 From 2011 to 2013, Japan’s favorability has been closer to—and sometimes below—that of North Korea’s. With current sentiment, the risk of public backlash for engaging Japan is thought to be embedded with no clear upside. But as the data suggests, these views are not intractable. Unlike the ratings for the United States, China, and North Korea—the decline from 2012 to 2013 notwithstanding—the favorability of Japan is more vola- tile. Because the favorability of Japan declined sharply from 2010 through 2012, this also suggests that it could rebound quickly given the correct conditions. Of course, creating those conditions is tricky. A complication in creating those conditions is the perceived rightward shift taking place under Mr. Abe, with 76 percent stating that such a shift was taking place. This perception, coupled with statements made by Prime Minister Abe and other Japanese politicians that Koreans interpret as denying history, are driving the low favor ability ratings of Japan and its leader. To be sure, Mr. Abe is deeply unpopular in South Korea. Among the leaders of countries active in the region, Prime Minister Abe (1.7) was found to be only slightly more favorable than Kim Jong-Un (1.1), and both trailed the favorability of all other leaders included in the survey by a large margin (Figure 2). The negative sentiment toward Mr. Abe was broad, encompassing all political affiliations and age cohorts. With the toxicity of Japan in public opinion results discussed thus far, it is understandable that President Park has avoided engaging Japan. Interpreting this data to mean that the South Korean public does not support engagement with Japan is certainly politically convenient, but is also incorrect. Questions on favorability and leadership draw on a respondent’s memory and understanding of both historic and recent events. They say little about what the South Korean public wants to see unfold between Korea and Japan moving forward. When respondents are questioned on specific events that would ostensibly be seen as a step forward, a majority of South Koreans are in support. These steps would include the signing of the General Security of Military Information Agreement (GSOMIA) and a Park-Abe summit. For its part, Japan has signaled willingness to establish a working level relationship. It was Japan that proposed the Park-Abe summit, and according to a Japanese diplomatic source who requested anonymity due to the sensitivity of the subject, the two sides were also in discussions to meet bilaterally at the ADMM+ in Brunei in late August 2013. While the source declined to confìrm which side proposed the meet- ing, it seems likely that Japan approached Korea given the circumstances (The two sides did not meet due to a “scheduling conflict”). At the same time, when Korea is ready to sign GSOMIA, Japan is ready and willing. Thus far, President Park has pursued the low-hanging fruit of summits. Meetings with United States, China, the G-20, and Vietnam all presented convincing domestic PR wins and came at opportune times. They allowed her to appear presidential, to pursue economic gains by toting along signifìcant business delegations, all while avoiding difficult domestic subjects. Thus far, the Park administration has been risk adverse, and engaging Japan is certainly seen as a risky proposition. But a summit with Mr. Abe is not as risky as the Blue House may think. Despite the negative attitudes on Prime Minister Abe and towards Japan itself—the latter of which are not set in stone—there is clear support among the South Korean public for a Park-Abe summit. A majority (58%) of the South Korean public sup-supports a potential summit between President Park and Japan’s Prime Minister.3 What is more, such a summit has both support across the ideological spectrum (Figure 3, right) and support of a majority of all age cohorts (Figure 3, left). While 57 percent of Saenuri supporters approved of such a summit, 67 percent of Democratic Party supporters stated the same. For age cohorts, those in their sixties (52%) were least likely to support the summit, and those in their twenties (67%) were most likely. Korea and Japan previously sought to enact GSOMIA in June 2012 while Lee Myung-Bak was still serving as the South Korean president. However, the agreement was abandoned mere hours before the scheduled signing due to public out- rage in South Korea. Opposition to the agreement was clear in a public opinion poll conducted in the immediate wake of its failure. While 61 percent opposed the agreement, only 23 percent stated support. But on the question of necessity of the agreement, the public was evenly divided with 44 percent viewing the agreement as necessary and 44 percent as unnecessary. The failure of GSOMIA was broadly interpreted by both foreign and domestic observers as being sparked by anti-Japan sentiment in Korea. However, the data does not support this interpretation. In the data gathered from the July 2012 survey, just after the failure of GSOMIA, regression analysis showed that attitudes on Japan— measured by favorability—were significant in predicting both support/opposition and on the necessity of the agreement. However, the predictive power was very weak. 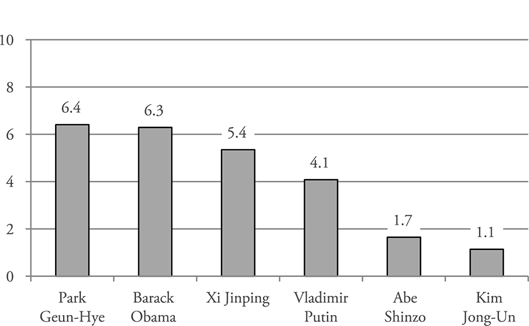 A far stronger predictor was attitudes towards President Lee. It was the high animosity toward the president himself and his handling of the agreement which sparked the protest against GSOMIA and led to its ultimate failure. 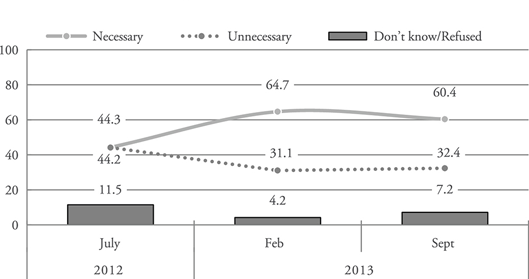 Now that President Lee has left office and the initial furor over GSOMIA has passed, attitudes on the necessity of GSOMIA have improved significantly (Figure 4). In September 2013, 60 percent viewed GSOMIA as being necessary. Moreover, this was not a result that was skewed by one demographic being heavily in favor while another was largely opposed. 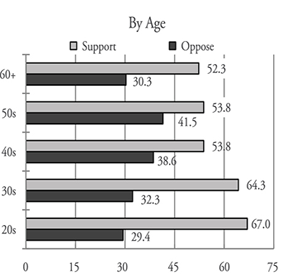 Support was both bi-partisan (Figure 5, right) and spread across all age cohorts (Figure 5, left). It is worth noting that the questions for July 2012 and September 2013 differed slightly from the question asked in February 2013. Because the February 2013 survey was conducted in the wake of North Korea’s third nuclear test, the question wording asked respondents if GSOMIA should be pursued as a response to the North Korean threat. The other two data points did not include that reference. That the results from September did not differ greatly from those of February suggests that the necessity of GSOMIA is not just based on the North Korean threat, and that this number should remain stable moving forward. While President Park may be wary on pushing for the signing of GSOMIA due to the treatment given to President Lee when he attempted to do the same, analysis shows that the initial opposition was not a strong anti-Japan reaction, but rather a reaction to the method President Lee employed—a method that was interpreted by the Korean public as a backroom deal. When President Park is ready she can learn from President Lee’s mistakes. She must first present a clear, reasoned, principled argument for why she believes GSOMIA improves the long-term security of South Korea, and then open the floor for discussion. The numbers suggest she will win that debate, giving her a significant foreign policy victory in the process. It is easy to assume that the South Korean public does not support an attempt at rapprochement with Japan. However, an investigation of the public opinion survey data indicates that a broad swath of the South Korean public does support a move to improve relations with its neighbor. Summits with the United States, China, and Vietnam were easy wins and helped President Park to establish political capital, and progress on inter-Korean relations helped to push her approval ratings into the low 70s. While the time to spend that political capital may not be now, it should not be significantly delayed. When President Park’s approval ratings begin to decline—as they have for every president—engagement with Japan will be a more difficult sell. With public opinion data in mind, perhaps it is time for President Park to rethink her position on Japan. This report is a product of the Public Opinion Studies Center at the Asan Institute for Policy Studies. To subscribe to The Center’s reports please contact Karl Friedhoff at klf@asaninst.org. Annual Survey 2010: The Asan Annual Survey 2010 was conducted from August 16 to September 17, 2010 by Media Research. The sample size was 2,000 and it was a Mixed-Mode survey employing RDD for mobile phones and an online survey. The margin of error is ±2.2% at the 95% confidence level. Annual Survey 2011: The Asan Annual Survey 2011 was conducted from August 26 to October 4, 2011 by EmBrain. The sample size was 2,000 and it was a Mixed- Mode survey employing RDD for mobile and landline telephones. The margin of error is ±2.2% at the 95% confidence level. at the 95% confidence level. The survey was conducted by Media Research. 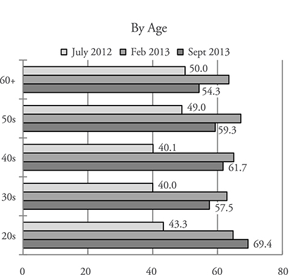 July 2013, September 2013: The sample size of each survey was 1,000 respondents over the age of 19. The surveys were conducted by Research & Research, and the margin of error is ±3.1% at the 95% confidence level. All surveys employed the Random Digit Dialing method for mobile and landline telephones. The views expressed herein do not necessarily reflect the views of the Asan Institute for Policy Studies. 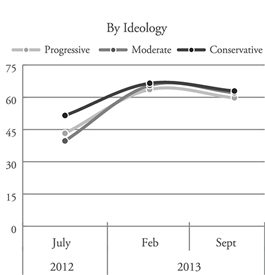 Data from the survey conducted September 5-7, 2013. Favorability of each country is measured on a scale of 0 to 10. It is important to note that the question on the summit set no preconditions for the meeting to take place. 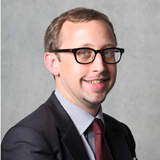 Karl FRIEDHOFF is a program officer in the Public Opinion Studies Program at the Asan Institute for Policy Studies. Prior to joining the Asan Institute, he was a program assistant at the Institute for Global Economics. He earned an M.A. in international commerce at Seoul National University and a B.A. in political science at Wittenberg University. His writing has appeared in the Korea Herald and the Joongang Daily. 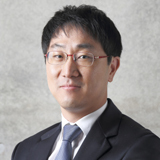 Kang Chungku is a senior research associate at the Asan Institute for Policy Studies. Prior to joining the Asan Institute, he was a research assistant at the Korea Dialogue Academy in Seoul. He earned both an M.A. in Sociology and a B.A. in English at Korea University. His research interests include quantitative research methods, survey design, and statistical data analysis.